The first time you use an Office 365 Contacts card in your FLO, you will need to authorize an account. 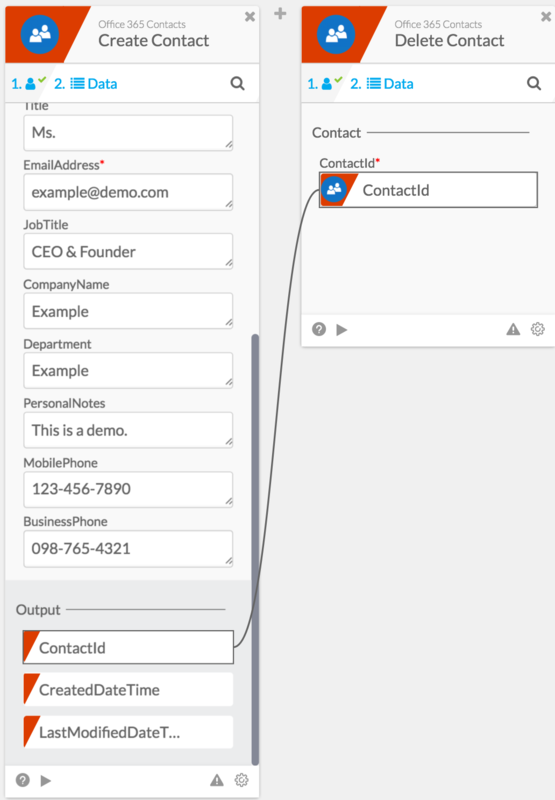 This flow activates each time a new contact is added to your Office 365 People. ContactId (text): The unique ID of the new contact. This can be dragged to other cards to be used as identification. DisplayName (text): The name that will be displayed in your Office 365 contacts. GivenName (text): This name will show up as the first name of the contact. MiddleName (text): This name will show up as the middle name of the contact. Surname (text): This name will show up as the last name of the contact. Initials (text): the initials of the contact, for example John Cardholder Doe’s initials would be JDC. Title (text): The contact’s title, for example, Dr., Mrs., Mr., or Sr.
Email Address (text): the email of the contact. JobTitle (text): the job title of the contact. CompanyName (text): the name of the company where the contact is employed. Department (text): the department the contact is employed in. Birthday (text): the Birthday of the contact. PersonalNotes (text): any personal notes about the contact. MobilePhone (text): the contact’s personal phone number. FolderID (Number): the ID of the folder the contact is stored in. CreateDateTime (text): The exact date and time of the contact’s creation are returned. This flow activates each time a contact is updated added to your Office 365 People. FolderID (text): the ID of the folder the contact is stored in. LastModifiedDateTime (text): The exact date and time of the contact’s last modification. Creates a new contact in your Office 365 People. DisplayName (text): Input a display name, however, this name will not show up in the contact card. Initials (text): It’s optional to add the initials of the name, however, it will not appear in the contact. Email Address (text): Enter the email of the contact. JobTitle (text): Enter the job title of the contact. CompanyName (text): Enter the name of the company where the contact is employed. Department(text): Specify which department the contact is employed in. PersonalNotes (text): Add a note about the contact. MobilePhone (text): Input the contact’s personal phone number. BusinessPhone (text): Input the contact’s work or professional phone number. LastModifiedDateTime (text): The exact date and time of the contact’s last modification are returned. Contact ID (text): In order to the delete the contact, the ID is needed. This is returned by the create contact card and can be dragged into the slot. The picture below is an example of how to get the contact ID to delete a contact. This card returns all the information about a contact created. The returned information is exactly the same as those inputted in the create contact card. DisplayName (text): The display name that was entered when the contact was created. This is different than the given name which appears as the first name of the contact. DisplayName _(text): The display name, however, this name does not show up in the contact card. **GivenName (text): **The given name which shows up as the first name of the contact. MiddleName (text): The middle name of the contact. **Surname (text): **The last name of the contact. Initials (text): The initials of the contact. **Title (text): **The contact’s title, for example, Dr., Mrs., Mr., or Sr.
**CompanyName (text): **The name of the company where the contact is employed. Department (text): The department that the contact works in. **PersonalNotes (text): **Notes about the contact. BusinessPhone (text): The contact’s work or professional phone number. This card will make changes to an existing contact. It essentially works the same as the create contact card. Contact ID (text): The ID of the contact is needed to update it. This is returned by the create contact ID and it can be dragged into the slot. **GivenName (text): **This name will show up as the first name of the contact. **MiddleName (text): **This name will show up as the middle name of the contact. **Surname (text): **This name will show up as the last name of the contact. **Initials (text): **It’s optional to add the initials of the name, however, it will not appear in the contact. **Email Address (text): **Enter the email of the contact. **JobTitle (text): **Enter the job title of the contact. **CompanyName (text): **Enter the name of the company where the contact is employed. **Department(text): **Specify which department the contact is employed in. **PersonalNotes (text): **Add a note about the contact. **MobilePhone (text): **Input the contact’s personal phone number. **BusinessPhone (text): **Input the contact’s work or professional phone number. **ContactId (text): **After the contact has been created, it will return an ID. This can be dragged to other cards to be used as identification. **CreateDateTime (text): **The exact date and time of the contact’s creation are returned. **LastModifiedDateTime (text): **The exact date and time of the contact’s last modification are returned.